We find many of our dearest discoveries over drinks at dinner. Sake is no exception. Once we evolved beyond the warmed sake of yore to discover the varied styles beyond this inert custom, a light bulb flickered and down the rabbit hole we went matching mineral junmai to favorite oysters, sipping delicate daiginjo with an array of subtly sweet and fragrant foods, while savoring those with less of their rice milled away with fuller flavors like tempura -even well marbled beef. Food is so often the low door in the wall. Our vinous fascination takes us from there. 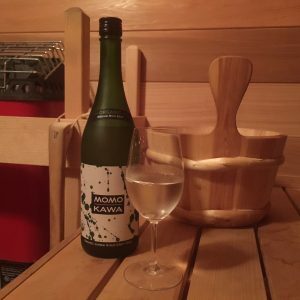 Wine and sake have much in common after all but we love sake all the more for being distinct in its own right -not least that it has less acidity and is free of tannins setting new opportunities at the table. For a grain grown in water, its goût de terroir is less an expression of climate, slope, weather, or a given variety of rice and more about the water itself and regional brewing traditions. A new terrain to be sure but how quickly we learn the cognates for the gin drinker’s aperitif, find a sake for that itch for a rich Meursault -even scintillating alternatives to Champagne. No wonder sake has earned a growing awareness and rising popularity. Sake is a world unto itself inspiring singular pleasures unique to this Gift of the Gods.